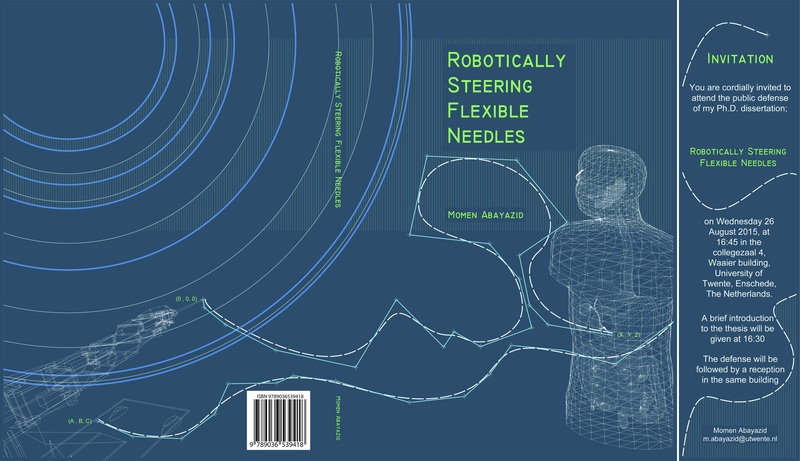 Momen Abayazid defends his doctoral thesis entitled “Robotically Steering Flexible Needles” on Wednesday, 26th August, 2015. 16:30-18.00 Short introduction to the content of the thesis and the public defense, in Prof.dr. G. Berkhoff Zaal, Waaier building, University of Twente. The defense will be followed by a reception in the same building. The university press release is available here. Percutaneous needle insertion is one of the most common minimally invasive procedures. Needles are often used for diagnostic and therapeutic applications. 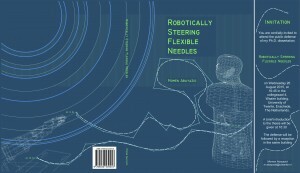 In this study, we develop 2D and 3D control systems to robotically steer flexible needles to a target. We integrate 3D tracking, path planning and control algorithms to steer a bevel-tipped flexible needle to reach a target in 3D space while avoiding obstacles. In some cases it is not desirable by clinicians to have fully automated control of the instrument due to safety considerations. For this reason we have also developed a system which uses shared control of these instruments where both the physician and the automated controller provide steering inputs using a tele-operative system. 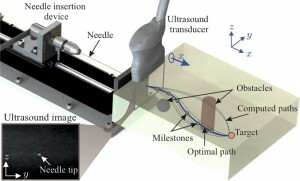 In this study, we could also replace the robotic (mechanical) designs used for needle tracking by a commercial ultrasound-based automated breast volume scanner (ABVS) that does pre-operative automatic scanning for target localization and shape reconstruction, and also intra-operative needle tracking during the steering process. This helps in bringing the presented needle tracking, path planning and control algorithms to clinical environments.